So you’ve decided that your next home will be in Minneapolis and now you have to find somewhere to live. Minneapolis is a pretty big city, so where do you begin? While the task might seem daunting, luxury homes in Minneapolis are quite easy to find as most of them are located in the Chain of Lakes region southwest of downtown, as seen in the listing snapshot showing current luxury homes for sale in Minneapolis. Probably the most important decision to make is how much you want to spend on your new home as it will determine on which lake you can afford to buy and of course how close to one of the lakes you can live. The most expensive and prominent area of the Chain of Lakes is around Lake of the Isles and just northeast of this area – calledLowry Hill. Some of the premier mansions were built in this area by prominent architects and are in wonderful condition. Others are in need of repair and updating so you will want to take that into consideration as well, but no matter what condition they are in, prices for these homes can range from $2 Million- $7 Million. Surrounding Lake Calhoun and Lake Harrietare old historic and luxury homes nestled along beautiful landscaped streets that are a little more affordable when compared to Lake of the Isles – by affordable, prices start at $800,000 and go up to $2 Million. No homes sit directly on the lakeshore, but are located starting a block away. One of the biggest draws to the area are the trails surrounding the lakes, which accommodate cyclists, joggers, walkers, and rollerbladers. 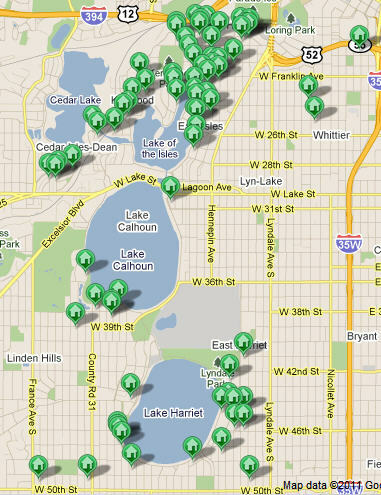 Now that you have thought about the price tag of your new Minneapolis luxury home, it’s time to drive around the area and see which lake you like the best. While all three are close together, each lake along the Chain of Lakes as its own atmosphere. Lake Calhoun has a younger vibe, with families and young entrepreneurs, not to mention the close proximity to Uptown which features shops, restaurants, and a local bar scene. Lake of the Isles has a more upscale feel with the more expensive homes, featuring neighborhoods that twist and turn along winding streets and a hilly landscape. The southern most lake, Lake Harriet, is more structured with cottage style homes and gardens, not to mention a fantastic park on the northern shore. Residents can enjoy concerts at the bandstand, ride the trolley, or enjoy swimming or boating on the lake. Purchasing a luxury home in Minneapolis is a big decision, but one that can easily be helped by talking to a real estate agent. Many times I find that the home is what buyer’s fall in love with, not necessarily the lake it sits near. If you are ready to start shopping, you can begin your real estate search here, or give me a call – I’d love to help! Where Do Minnesota Buyers Find Their Homes?